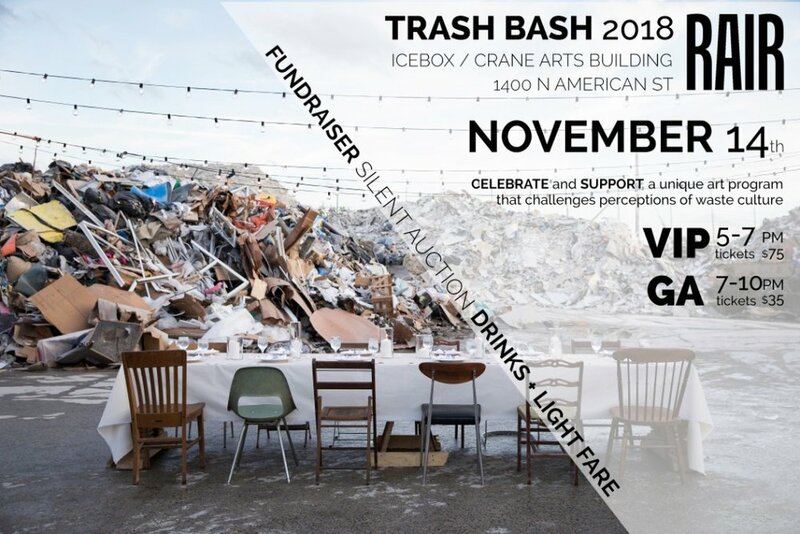 For the fifth consecutive year , RAIR will host its Trash Bash Fundraiser and Silent Auction on Wednesday, November 14, 2018 at the Ice Box, 1400 N. American Street in Philadelphia. Join us in celebrating the successes of this year’s artists in residence and help raise funds for 2019 programming. If you’ve never been, the Trash Bash evening includes a champagne VIP reception at 5 PM where VIP guests will have first access to bid or buy-it-now on an array of works by local artists, ‘Trash Boutique’ items, and Philly-centric packages and experiences. Bidding for the silent auction will fully open at 7pm for the main event. Early Bird discounted tickets will be on sale until October 15, 2018. This year we’re offering a new ticket option (#FOMO), for those of you who cannot make the event but still want to contribute. Please also take a moment to consider becoming an event sponsor (or tell your friends to become sponsors!). There are several price points for sponsorship donations but all will be instrumental in allowing our residency program to grow beyond its current capacity and to become an even richer resource for artists.